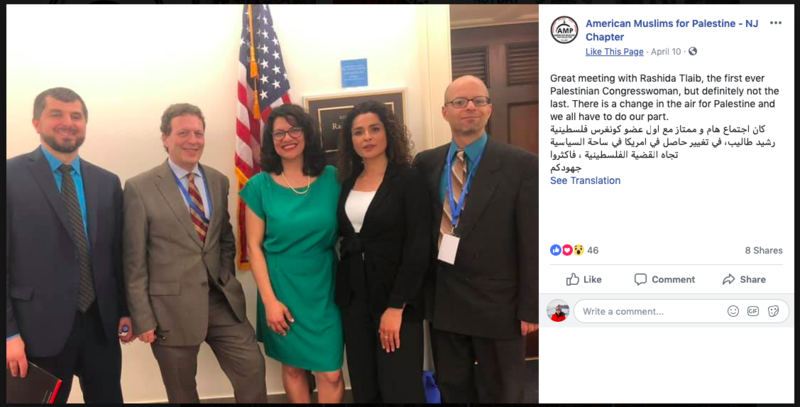 Democratic Michigan Rep. Rashida Tlaib met with members of the anti-Israel organization American Muslims for Palestine during an advocacy event they hosted on Capitol Hill. Tlaib was photographed after sitting down with Joe Catron, an extreme anti-Israel activist and outspoken terrorist supporter. Tlaib’s time in congressional office has been embroiled in allegations of anti-Semitism. 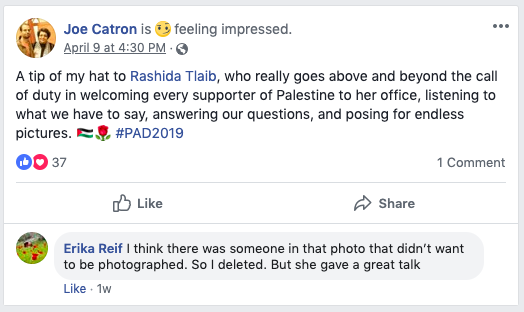 “A tip of my hat to Rashida Tlaib, who really goes above and beyond the call of duty in welcoming every supporter of Palestine to her office, listening to what we have to say, answering our questions, and posing for endless pictures,” Catron wrote on Facebook following the meeting. Catron is a long-time extreme anti-Israel activist and has openly supported terrorist organizations. He serves as the U.S. coordinator of Samidoun, the Palestinian Prisoner Solidarity Network. Samidoun is an affiliate arm of the Popular Front for the Liberation of Palestine (PFLP), a Palestinian Marxist–Leninist and revolutionary socialist organization. The United States designated PFLP a terrorist organization in 1997, and Australia, Japan, Canada and the European Union shortly followed suit. Catron’s cover photo on both of his personal Twitter and Facebook accounts is a montage of a PFLP fighter donned in the organization’s official logo, as well as rockets and soldiers pointed towards a target over the state of Israel. It also displays the Arabic phrase “If you do [more attacks on Gaza] we will do [as well], hell is waiting for you.” The phrase is attributed to Mohammad Deif, the supreme military commander of Izz ad-Din al-Qassam Brigades, Hamas’s military wing. Moreover, the feature image on his social media accounts are of himself posed alongside Leila Khaled, a member of PFLP who is a known Palestinian terrorist most notable for hijacking airplanes. After PFLP murdered an Israeli policewoman in 2017 during a terrorist attack in Jerusalem, Catron posted PFLP’s official statement on his social media and referred to the event as “heroic.” The attack was described by the PFLP as a “blood oath” to Palestinians, and the organization echoed the Hamas war cry to eradicate Israel. Catron has voiced his support and admiration for Hezbollah, simply stating on Feb. 8, 2019 “I [love] Hizbullah.” He also urged Hassan Nasrallah, the leader of the Islamic-terrorist organization, to fire rockets at Israel. In addition to supporting PFLP and Hezbollah, Catron has also be an advocate for the Sunni-Islamist fundamentalist and terrorist organization Hamas. In 2014, Catron was a participant in a press conference alongside Tawfiq Abu Naim, the head of Hamas-run security forces in Gaza. 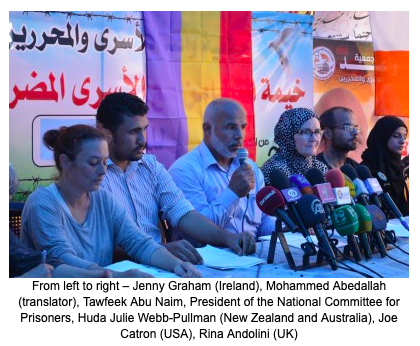 The press conference was to support Palestinian prisoners, according to The Gaza Scoop. Tlaib, along with fellow Democratic Rep. Ilhan Omar of Minnesota, became America’s first Muslim congresswomen when sworn into office in January. Their time in office has been embroiled in allegations of anti-Semitism. Tlaib invited pro-Hezbollah, anti-Israel activist Abbas Hamideh to her swearing-in ceremony and the following private dinner in January. She is also a member of multiple anti-Semitic social media groups, including the Facebook group “Palestinian American Congress,” where members frequently demonize Jews and Israel. The founder of the aforementioned Facebook group, Maher Abdel-qader, is a Palestinian activist and was a key fundraiser for Tlaib’s 2018 congressional campaign. Neither American Muslims for Palestine nor Tlaib’s office responded to The Daily Caller News Foundation’s request for comment.